Home Trending Thinking Of Switching Careers To A Developer? If you come from a background of anything but computer science and have been toying with the idea of switching into a data scientist role(or any developer role), I know what’s going through your mind. So many questions.. “How can I get a job, I don’t even have a degree in Computer Science?”, “I’ve never written a line of code, how can I make it?”, “Is it too late for me to try and break in?”. If you are thinking of switching careers, chances are you are already in an uncomfortable situation and all these question makes it even more taxing. I know because I was there. I graduated with a chemical engineering degree and not too long after an internship that left a very bitter taste in my mouth, I realized and gathered enough courage to accept that that particular career was not for me and finally decided to pursue what had always fascinated me: AI and what computers could do with data. The moment I decided though, all these doubts started creeping in and made me question my decision. “What if this career is just as unsatisfying?”, “With no experience and formal education, what will I be even worth?”. The point I’m trying to make is that you probably have similar doubts if you are planning to do down this path. So this blog post is to ease the mind of anyone who’s in this situation. But before I start, I must applaud your courage for deciding to do so. I Have The Answers. But How? I know what you’re wondering: how do I even have the answers? Well, I could say from experience but as an aspiring data scientist, to demonstrate how data science can make any decision making process easier and ensure you make the correct decision. I’ll be using data from the 2018 stackoverflow survey. With more than 100,000 responses fielded from 183 countries and dependent territories, stackoverflow’s 2018 Annual Developer Survey is the most comprehensive survey of software developers ever conducted. All aspects of the developer experience from career satisfaction and job search to education and sound preference when coding were surveyed. Let’s dive in! Question 1: How Satisfying Would A Career As A Developer Be? If you’re considering a new career, be it as a data scientist like me or any other kind of developer, chances are you are not satisfied with your current job or career. As you make this huge decision, it’s normal to ponder if your new career does not work out the same way. Before moving into a new field, it’s important to know if it will be the same or give genuine satisfaction. So let’s see how developers around the world feel about their work. Looks like quite a large percentage of developers are satisfied with both their jobs and careers, with above 18% showing high levels of satisfaction for both. So if you love coding and and all the facing other challenges that developers face it’s likely that you’ll be satisfied with your job and new career! Satisfaction with your work is not only dependent on where you work or what you work as. The relationships you build at work are also somewhat crucial. So let’s have a look at relationships between developers. 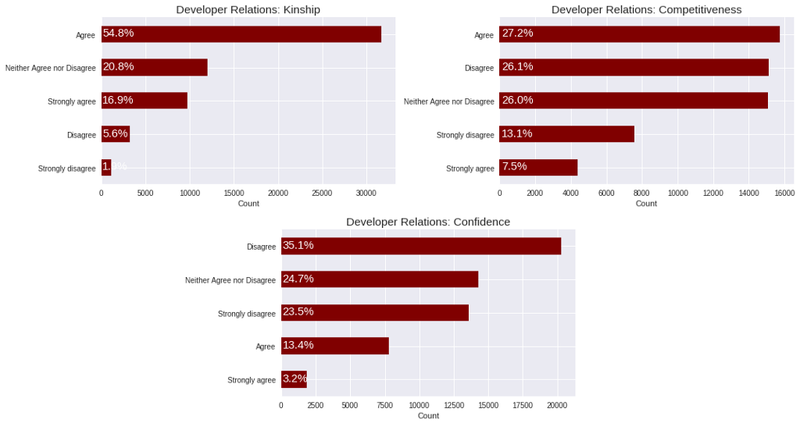 It’s nice to know that over half of the respondents feel a sense of kinship to other developers. The online communities of developers such as stackoverflow is a testament to this. It’s important to have the support and help of your peers at work. Only around 27% of the developers have competitive attitudes, which isn’t necessarily a bad thing. Healthy competition among co-workers can produce great results. Finally, majority of the developers disagreed with the notion that they feel their peers are better than them, meaning they are confident in their own abilities. Question 2: What’s The Pay Like? So next, you’re probably wondering if it’s worth it. If it’s financially rewarding. The answer to this depends on a lot of things. Your skills and technical abilities, your coding experience and to some extent your formal education as well. But one of the biggest factor may very well be beyond your control: your geographical location. So let’s have a look at what the annual salary distribution is like for developers in some countries. USA has the highest average salary for developers followed by the UK. India’s mean salary for developers is quite low. For all 9 of these countries, most of the developers are making less than the average salary for developers in that country. Having moved to Australia recently, it’s encouraging for me to see it’s mean pay for developers is relatively high. Just need to break in now! The salary of a developer does not only depend on the country, it also depends on the kind of work they are doing. Here, we will build a function that will give us the annual salary distribution of any kind of developer in any country. 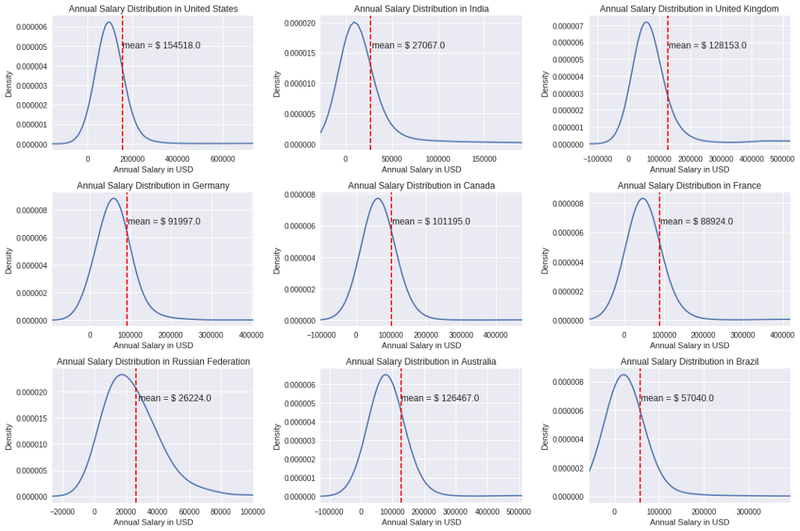 So I built a function that gives you the annual salary distribution of the kind of developer you want to be in your country. 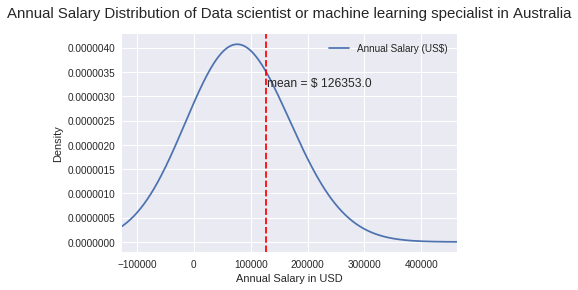 Having just moved to Australia to pursue a career in data science, I was curious to see what my future pay could be like.. The mean salary for data scientists in Australia is around the same as that for developers in general. Also, most data scientists here have a salary just below the mean. Question 3: What Language To Learn First? So now that you have some answers that convinced you to go on with this decision. You have to start learning. And beginning to do so can be just as overwhelming. One of the things you might find yourself thinking about is what language you have to know. Let’s start tackling this by first looking at what different developers from around the world use. The function below gives you the top 10 most used language for the field you are looking to break into. 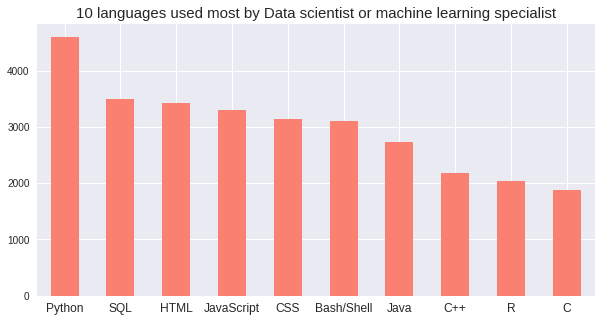 Again, I used it to see what the results were like for data scientists..
Python is the most widely used language by data scientists, SQL and HTML come in at second and third while R is not as widely used. This was a surprising discovery for me as I saw a lot of job postings ask for R as a requirement. 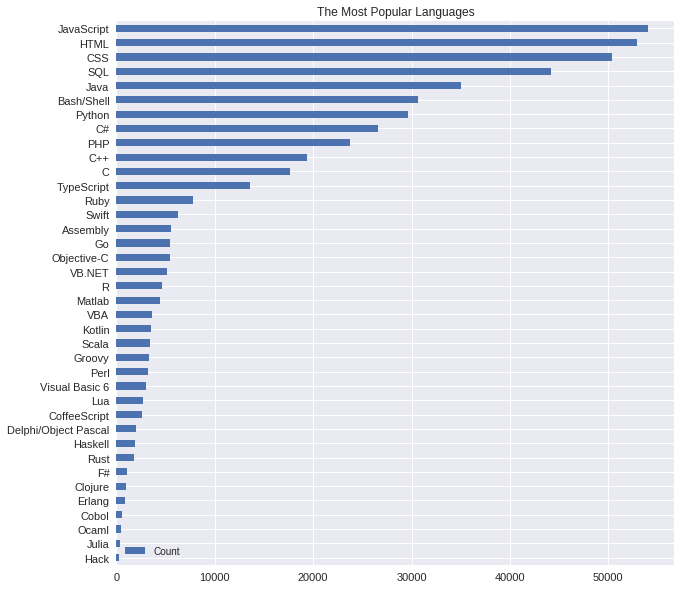 So if you are thinking of breaking into the data science field, you know what languages are important now. If you want to become some other kind of developer, just use the function and find out what’s important! Question 4: Will I ‘Make It’? Finally, we come to the question that has the most elusive answer. I totally understand the all the doubts that can run through your mind when you consider switching careers, especially if you don’t have any coding experience or formal education in the field and a lot of the times these things can decide if you can break into the field and thrive in it. So in an effort to put your mind to ease, I built a predictive model that takes in factors like your age, education and coding experience and tells you whether you ‘make it’ or not. That’s something isn’t it? A machine predicting your future. That’s not really far fetched anymore. with the correct methods and enough data and computing power, machines and predict just about anything. The future is here! But before we get on with it, we’ll first define what ‘making it’ means. ‘Making it’ has no solid definition and varies from person to person. For the purpose of this model, we will define it as getting an annual salary that is over the worldwide median for developers. This model however had an accuracy of just over 81%. This model can definitely be made better by tuning some of the hyperparameters of the model using gridsearch. However, due to restricted computational power, I was not able to do so. And of course, I wanted to put in my details to the model to see if I would ‘make it’ in Australia as a data scientist with whatever qualification and experience I have. Fingers crossed! Woohoo! Looks like as it is, I can make it! However, the model is only 82% accurate and my case just could be a false positive. So I’ll keep my fingers crossed and keep working hard! If you want to have a peak at the details of the model, head over to the github repository for this project. While you are there, feel free to use this model if you are considering starting a new career as a developer and fretting over the same things as me when I started. This is a very simple model with an accuracy of just 81%. You could be a false negative. The definition of ‘making it’ used here is not perfect. If you love what you do and work hard, you will make it. Hopefully, some of the content here will be able to put your mind at ease and help your decision making easier. You have all the facts you need, you have gathered the courage to consider this path. Now all you need to do is go on and take this challenge and ace it. I wish you nothing but the best. Thinking Of Switching Careers To A Developer? was originally published in Towards Data Science on Medium, where people are continuing the conversation by highlighting and responding to this story.